;celebrates these unbelievable and hilarious human errors through this collection of daily “FAIL” winners from failblog.org, Cheezburger’s most popular website, enjoyed by more than 8.5 million unique visitors a month. Ten categories, including “On the Job”, “At School”, “In a Relationship”, and “With Your Pets”. 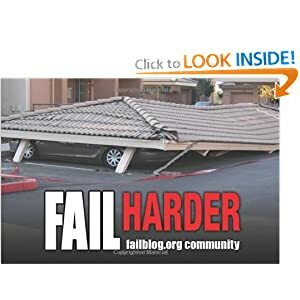 Fail Harder features ironic twists, horrible grammar, and amusing mistakes through incredibly entertaining “FAIL” pictures ranging from a school bus parked at an adult video store to a sign advertising zero percent off. Sure to induce teary-eyed laughter and side-splitting fun, Fail Harder and enjoy. Launched in January 2008, FAIL Blog won back-to-back Webby Awards in 2009 and 2010 and made Internet history by being the first comedy channel on YouTube to rack up more than 1 billion video views. FAIL Blog is the most popular website in the Cheezburger Network which also includes hilarious websites such as I Can Has Cheezburger?, Know Your Meme, Memebase, and The Daily What. As one of the largest online humor publishers in the world, Cheezburger counts a passionate fan base of 19 million people who upload more than 500,000 pictures and videos as well as view 400 million pages and 110 million videos each month. Cheezburger has a track record of New York Times best-selling books including I Can Has Cheezburger: A LOLcat Colleckshun and How to Take Over Teh Wurld: A LOLcat Guide 2 Winning. This book was hilarious! Whether you like the books that this company/group has come out with in the past, this book takes a look at some of the crazy things that people have done to send them into the FAIL hall of fame. There were so many images where I just said to myself, really? There were many others though where I could not stop laughing at the udder-idiotic nature of many of the pictures and the situations that were being shown. If you are looking for a book that will make you both laugh and shake your head in amazement, look no further than this book. I know that both my wife and I will be sharing this with many of our colleagues for a quick laugh within our busy days!